I, on the other hand, spurred by a desire to grow creativity, and a penchant for sleepless nights, have found that there is more to our sprawling wheat fields and rugged mountain ranges than meets the eye, and that's through a longer exposure. Here are four reasons to grab a shutter release cable and tripod and brave the cold! Don't forget: Aurora Borealis Schedule ( can be found online at www.aurora-service.org ). This is handy because it gives the auror-cast for the next three days. ​There's an old joke that if you lose your dog here, you can see him running for three days. It's mostly true, and at night, it feels like you might be in the cockpit of your favourite space craft staring out into infinity, or beyond. Summers, in particular, are an amazing time to take up astrophotography, as the Milky Way is the most visible and can make for some amazing and award-worthy photos. Pro-tip: Try to stretch yourself by taking several photos of the night sky and, using Lightroom, stitch them together to make a seriously breath-taking image of the Milky Way. As mentioned earlier, there is a little bit of everything in our little corner of the country. Fields? Check. Old farm buildings? Check. Gnarly old trees? Check. Whatever you may want, and where ever you live, there's something engaging to be found just down the road. Southwest Alberta and the Canadian Badlands are like two different worlds, only a few miles apart. What you'll need: A friend with a farm, or access to a coulee with hoodoos, or a Waterton Lakes National Park pass. This could be argued as part of the scenery section, but this hidden gem deserves a section of its own. Waterton is the perfect size: big enough for you to feel small, but small enough to find your way around in a couple days, or nights. Between Red Rock and Akamina Parkway, and along the shores of the deepest lake in the Canadian Rockies, you'll find places to light paint, spin steel wool, or use sparklers to write a cute message to your crush. Don't forget that one of the best places to see the Perseid meteor shower is here in the park! 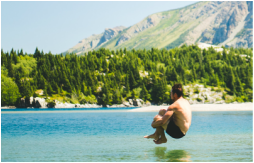 Visit www.mywaterton.ca/events to find out which weekend to book your stay next summer! Local secret: Right on the corner when you get into town, you'll find the Blakiston & Co. paddleboard, kayak, and canoe shop. Take one (preferably a SUP board) over to Boundary Bay to have a lakeside campfire while you watch the supermoon rise with friends, smores, and hot chocolate. While not an exhaustive list, this is a great way to branch out into another genre of photography you may be timid to start or try. Head over to my Instagram page @neekora for more ideas, tips, and tricks on how to capture a bit of the night sky for yourself!